Santa Cruz Rugs - Summertime Design, a deep luxurious silky soft pile in a range of highly fashionable colours. Each rug incorporates the use of contrasting colour tones that blend well and look stunning. The pile is 6cm in length and is made from 100% polyester, there are two different yarn thickness that gives this range a beautiful texture and shimmering look. 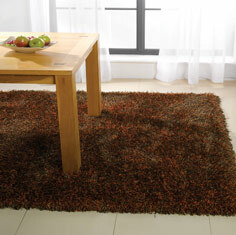 Santa Cruz rugs are an expensive looking rug at more than affordable prices.